Equilibrio Azul (EA) is a non-for-profit organization whose mission is the conservation of Ecuador's marine ecosystems and resources. It is thanks to volunteers, who believe in the importance of marine conservation, that EA can carry out its conservation projects. EA accepts volunteers throughout the year, and they can be integrated to our projects in course at any time. 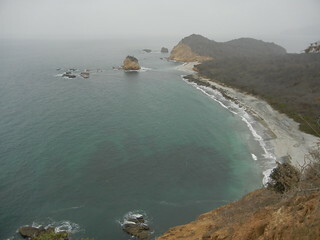 EA's projects take place in and around the Machalilla National Park, including La Plata Island (Isla de La Plata). Also, EA has another research project at Portete, Esmeraldas province. Currently, EA needs volunteers for its Marine Turtle Conservation and Environmental Education projects. Interested candidates should note that presently no scuba diving will take place during your volunteer time. However, you will aid EA's divers when they go out to capture turtles in the open sea. If you are interested in getting your diving certification while being a volunteer, please contact Equilibrio Azul directly (voluntarios@equilibrioazul.org) as they can suggest diving courses in Puerto Lopez. The Reef, EA's volunteer house, is located two blocks away from Puerto Lopez' beach front. This house holds up to 10 volunteers. It has electrical power, hot water, flushing toilets, kitchen with refrigerator, a grill for BBQ, hammocks and WiFi. The house does not have washing machines, although there is a spot to wash cloths manually and there are wires for hanging clothes. Note that in Puerto Lopez you can find laundromats as well. EA's volunteer program does not cover meal expenses. However, volunteers can make use of the stove, refrigerator, plates and other kitchen implements that are available at The Reef (and the house at Isla de La Plata). Puerto Lopez, with a population of approximately 17.000 inhabitants, is located in the Pacific coast of Ecuador, Manabi province. This port is one Ecuador's main fishing ports. Most people in Puerto Lopez are small scale fishermen, which means that they use fishing techniques that have a relatively small impact compared to industrial fishing. Puerto López is also a tourist destination and it attracts thousands of national and foreign tourists throughout the year. In late June starts the whale season and many tourists come to Puerto Lopez to watch these fascinating creatures. EA does not take responsibility if volunteers cannot begin or finish the program in time due to travel issues (e.g. lost suitcases, missed flights, etc.) or health ones. Unfortunately, EA can't refund any money paid towards the volunteer program.